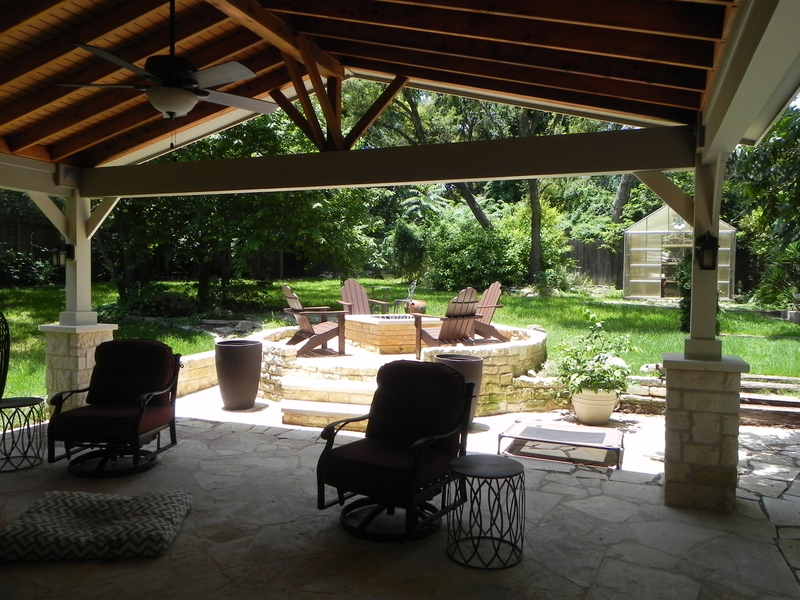 Austin covered spaces provide benefits beyond outdoor living enjoyment! When you take into consideration the benefits that can be gained by making the decision to add a covered outdoor living space, such as a covered porch, or patio cover, to your backyard the first thing that comes to mind is probably increasing enjoyment. Enjoyment IS a major factor when designing a covered outdoor living space, however, the benefits do not end there. In honor of July being observed as National UV Safety Awareness month. Skin cancer is the most common of all cancers. More than 1 million cases of skin cancer are found in the United States each year. Melanoma, the most deadly of skin cancers, only accounts for about 4 percent of all skin cancer cases, however, it causes about 79 percent of skin cancer deaths. Data indicates, in Texas, the odds of getting skin cancer are increased. One in three Texans will develop some form of skin cancer. Texas ranks third in the nation for malignant melanoma, the deadliest of all skin cancers according to the Texas Medical Association. 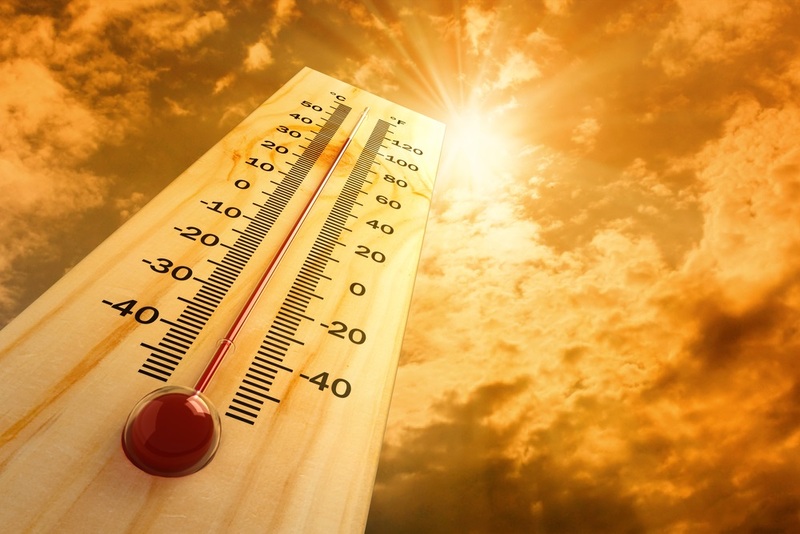 Since most of the melanoma and non-melanoma cases are directly related to sun-exposure, skin cancer prevention and awareness education could greatly reduce the number of those affected. This includes being cautious and limiting the amount of exposure you get on your uncovered outdoor living space. Covered patio in Cedar Park, TX. 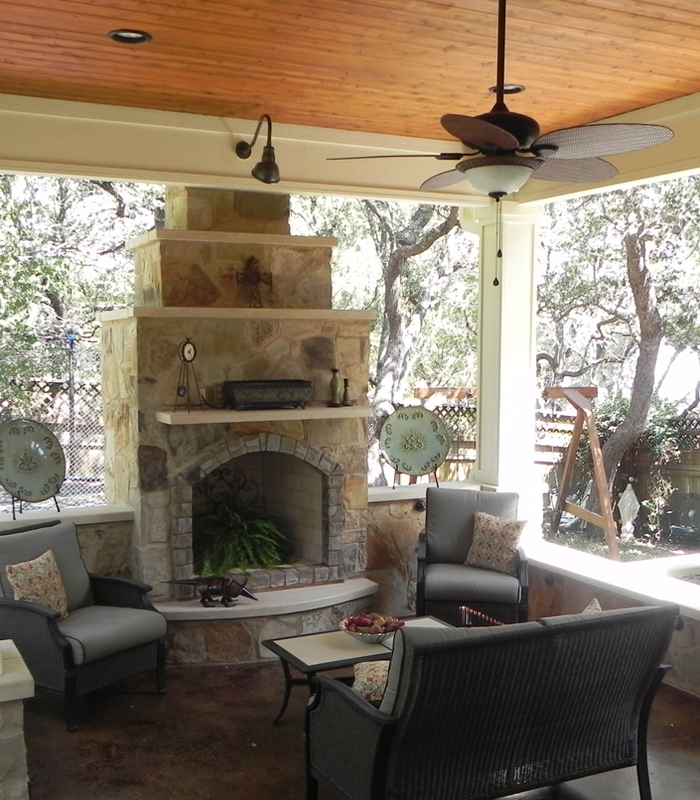 Our custom covered porches and patios are designed to protect you overhead without reducing your connection with nature. From simple front porches to complete outdoor entertainment areas, our porch and patio covers will transform your home from the outside in. A screened porch allows you to enjoy being outside without worrying about inclement weather, harmful UV rays, pollen or insects. You can relax while you take in the view and gentle breezes of your beautiful outdoor surroundings from the comfort of a protected space. 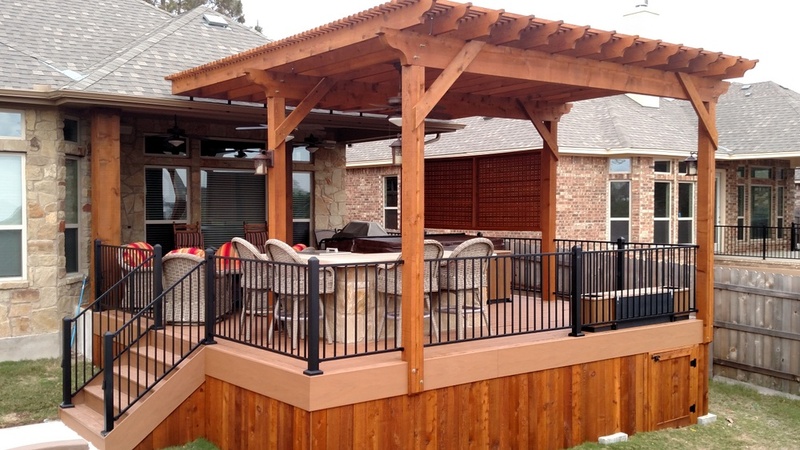 Screened porches and patios can also be used in conjunction with other outdoor structures such as a deck, patio, or even incorporate an outdoor fireplace kitchen to add more “flavor” to the design! Yes — This is a pergola! A pergola offers much potential to providing shade depending on the distance between the cross beams that cover the upper portion of the pergola. The construction of the pergola can be made more conducive to providing shade through the spacing between the cross beams located atop the pergola and by using wider rafters in the pergola design. The closer the beams are set, or the wider the rafters, the more sun protection your pergola will offer. All of these factors are influenced by the intended placement of your pergola in correlation to the direction and amount of sunlight your location receives. 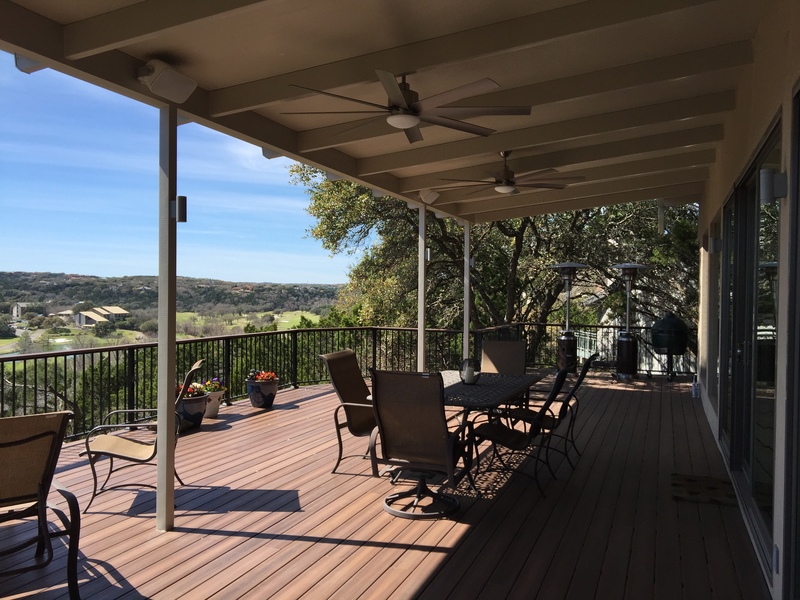 Archadeck of Austin can build your pergola with increased sun protection in mind while keeping the original design of your pergola intact. 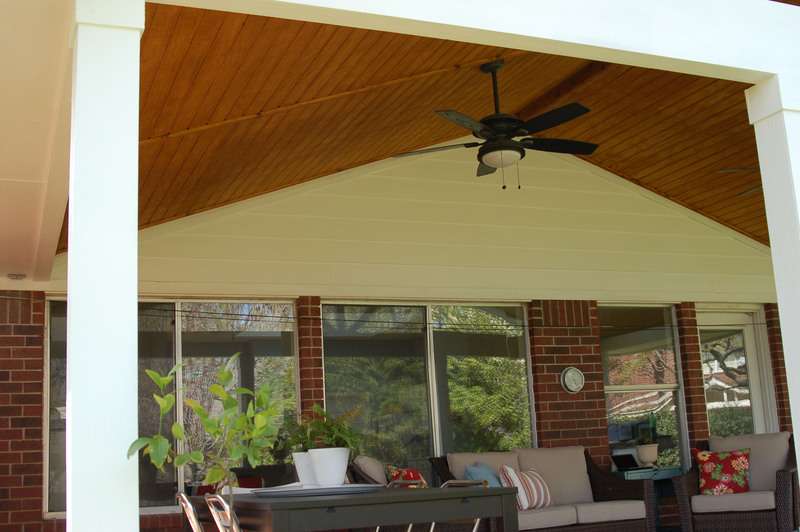 This may include integration of a Polygal cover into the design, curtains or blinds as we have many options available which can be customized to bring the most shade and comfort to your pergola addition. 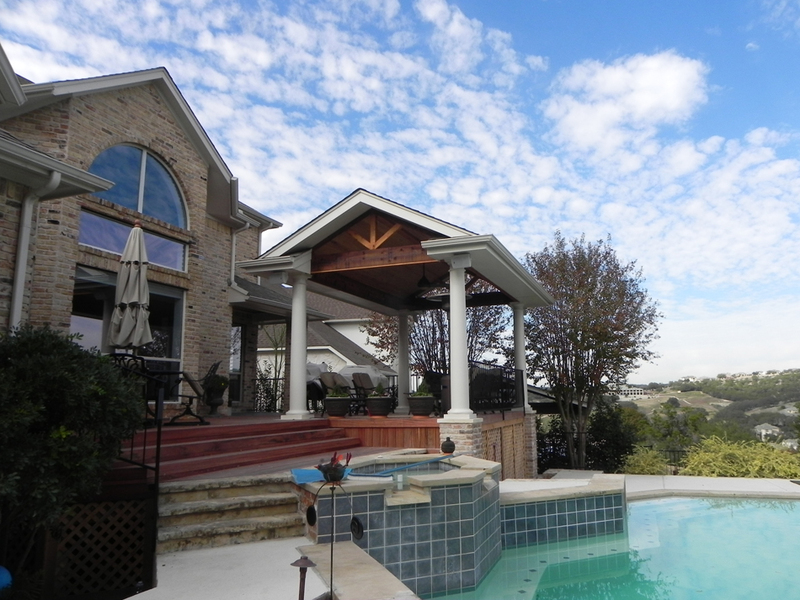 Poolside pergola addition in Bee Cave, TX. This project takes us to Lost Creek, directly beside Barton Creek in Southwest Austin. 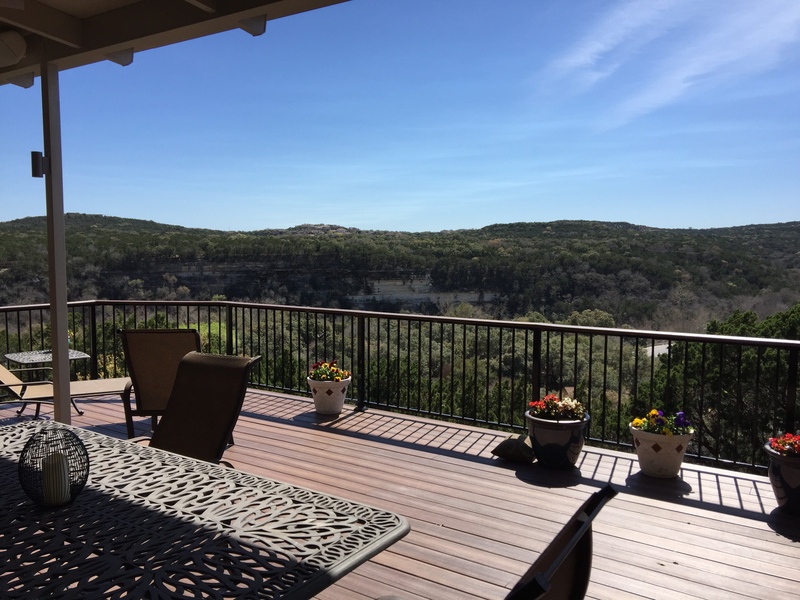 These homeowner’s hold a special place in our hearts here at Archadeck of Austin as we have worked with much of their family on previous projects and as always, they are a joy to design and build for. The design of this porch cover began to take shape after the homeowners requested a remodel to their existing elevated, back deck. They wanted a larger space that would accommodate family and friends and also a measure of shade. As part of their goal to revamp the entire home, they started with the area that they planned to utilize the most frequent — the rear deck. Upon inspection, we determined that the existing decking or the original space was in poor condition. Archadeck of Austin then removed the old deck and extended the footprint to better take in the scenic hilltop views. 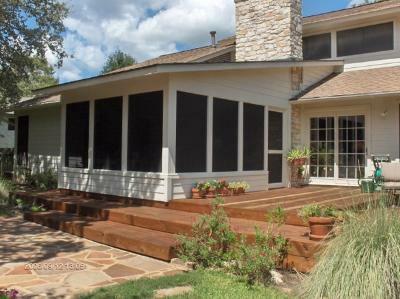 We used Fiberon Horizon low-maintenance decking in Tudor Brown. Horizon decking boards are capped (or covered) on all four sides with a patent-pending PermaTech® surface material. Four-side capping increases durability, enhances stain and fade resistance, and ensures a more polished appearance all around. Plus, Horizon boards feature two different wood grain patterns on the top and bottom for more design options and less on-the-job material waste. Horizon Decking also never needs sanding, staining or sealing which will allow these homeowners less worry of maintenance and more time for enjoyment in the new space! In addition to upgrading the deck, we also installed an aluminum Structall patio cover with a stucco embossed finish to add shade and protection from the weather. Traditional wood frame covers require more maintenance and their construction can be costly, drawn-out and inconvenient. Structural aluminum covers install quickly, are more durable, require less maintenance, and can be easily converted to a room enclosure later. Structall covers are attractive. Their continuous textured surface is available in stucco or cedar embossed finishes, These enamel finishes are baked onto the metal surface, making them virtually maintenance-free. Structall covers are also durable and engineered to last. 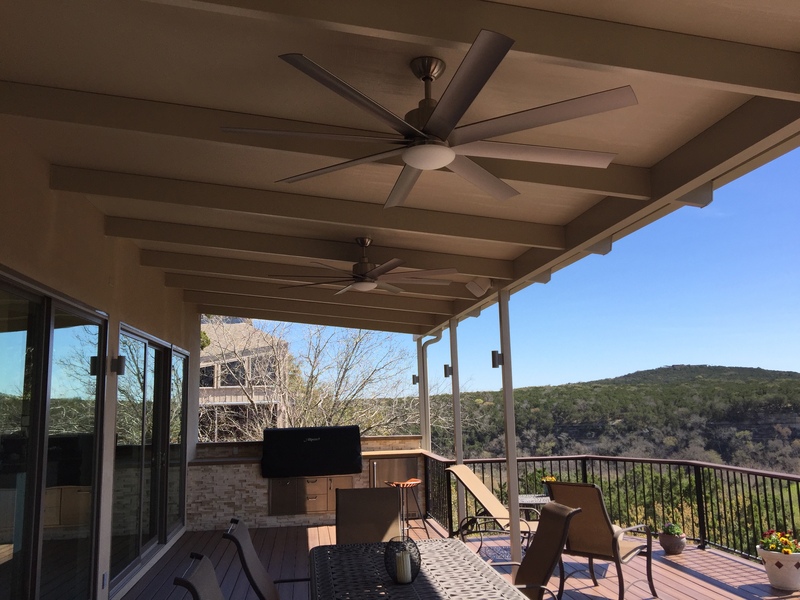 To gain the desired height of the patio cover, Archadeck of Austin redesigned the placement of the addition by raising the beam 1.5′ enabling it to sit higher on the home’s roof. The original placement meant the structure would come off the home’s soffits, however through ingenious design we were able to provide the height the clients preferred. The finished project is everything, and more, these Lost Creek homeowners had imagined. Now they can spend limitless weekends and afternoons with their close-knit family, grilling outdoors with a stunning view of the world around them —life is Good. If you are interested in making the most out of your outdoors with a new or improved outdoor living space, contact us today to discover how our custom, one-of-a-kind outdoor living designs can make it happen! You can reach us at ( 512) 259 – 8282 or email us at jim.odom@archadeck.net. 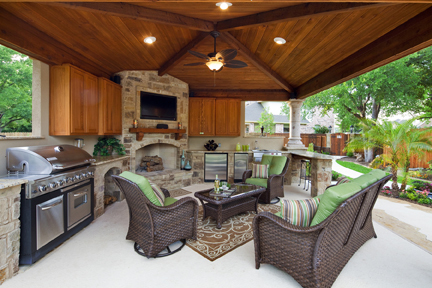 Are you yearning for a covered patio to grace your backyard this season? Maybe you are holding open a special place in your heart for an outdoor structure that will provide the function and beauty you have been wishing for. 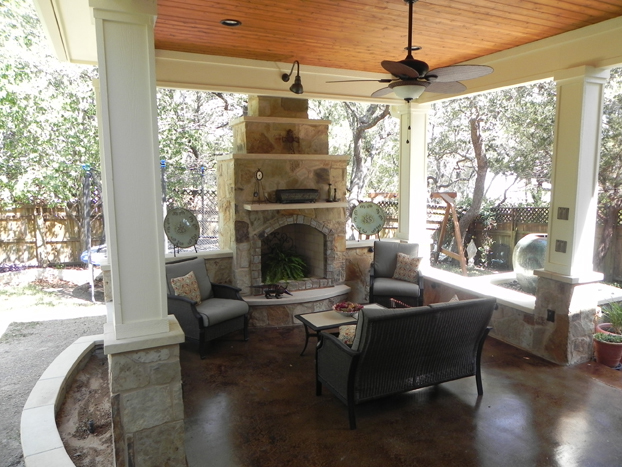 Archadeck of Austin specializes in creating stunning covered patio designs to help satisfy your craving. Since the covered patio is the ultimate outdoor living structure, and you can design each patio cover with a multitude of different options, we have compiled a list of the top 10 features our customers repeatedly ask to include in their design. Imagine the room right outside your back door. Outdoor spaces can serve the same functions as indoor spaces, only better. Have you ever looked at your home and wished you could purchase adjoining acreage just to add on a playroom, living room other space to your existing home? Why not think about your ideal living space in a broader sense. The fact is there is a plethora of living enjoyment area right outside your back door that can be utilized more efficiently than an interior addition. This cabana style covered patio has it all. 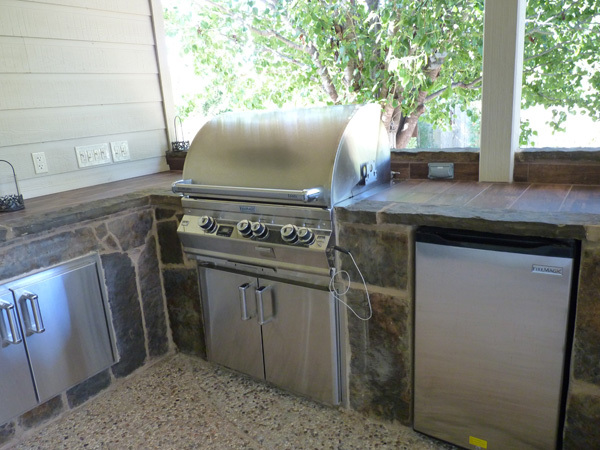 An outdoor kitchen, fireplace and plenty of room to play. 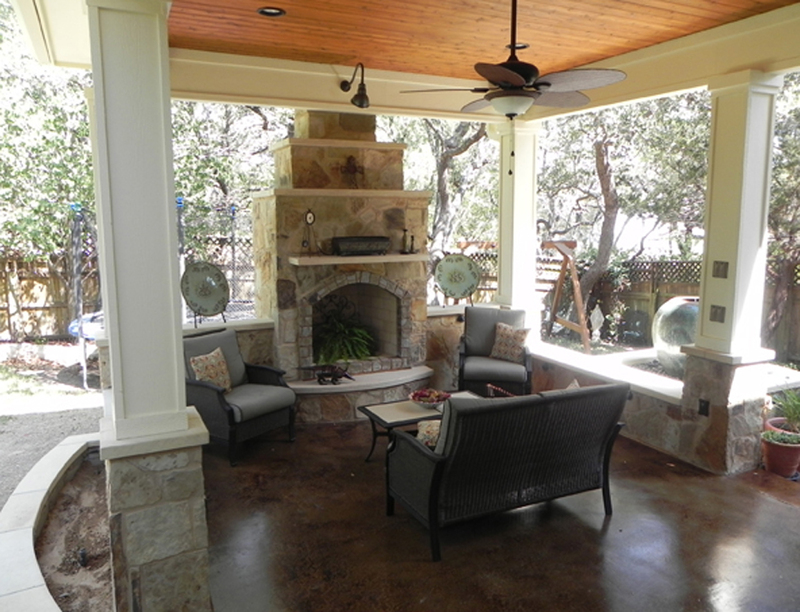 Covered patios keep you cool on hot days, and offer protection from the elements as well. They can be constructed from a vast array of materials such as wood, brick, stone and other hardscape material. Covered patios can be attached to your home or your deck, or can even be used as a freestanding structure within the landscape. Covered patios can also be situated beside your pool for a cabana style covered patio. 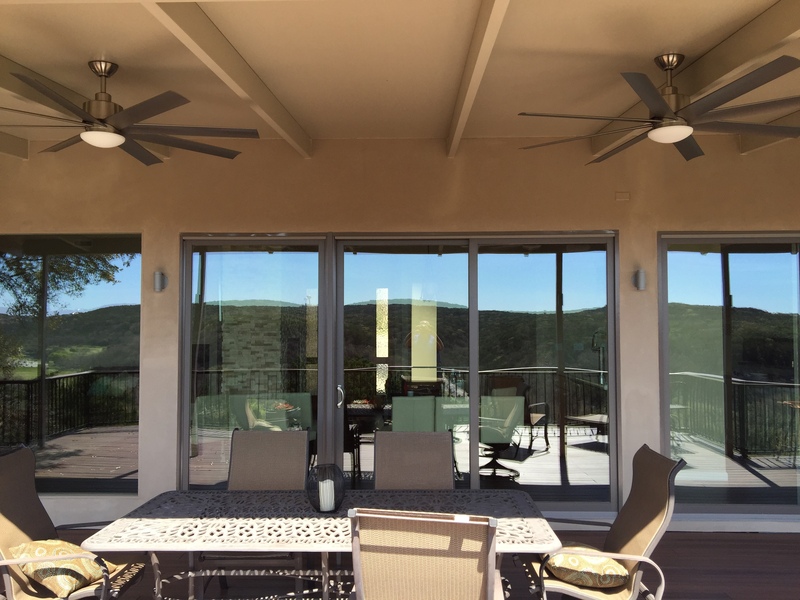 Covered patios can be wired to accommodate ceilings fans, sound systems, computers, telephone, and even flat screen TV’s. 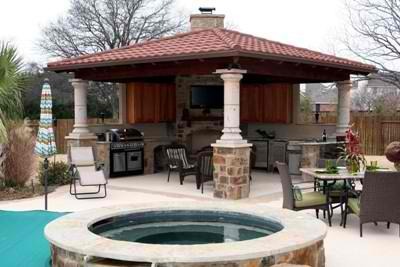 Patio covers can include built-in fireplaces and even contain fully functional outdoor kitchens with all the fixings. These include refrigeration, sinks, food preparation areas, warming drawers, microwave, smokers, and grills. You name it, we can include it into the design of your patio cover. If you are looking for the perfect place to watch the game, and prepare a feast for your guests all while watching the kids play, the covered patio is an all-around best outdoor structure. An outdoor living room with mother nature as the backdrop. The screened porch is another way to utilize all the amenities of an outdoor living room, minus the insects. 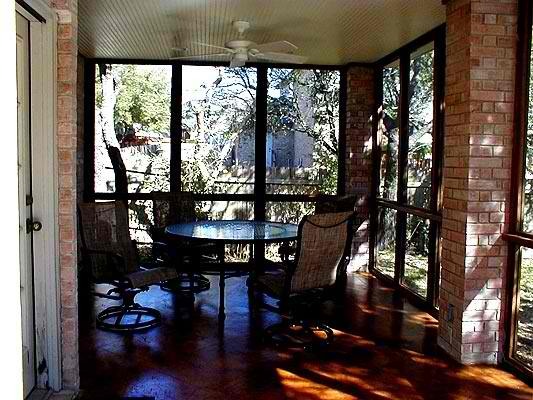 Here in Texas, the warm temperatures will give you the benefit of year-round enjoyment of your screen porch. We also refer to these as sun porches and they make a perfect spot to relax and rewind. 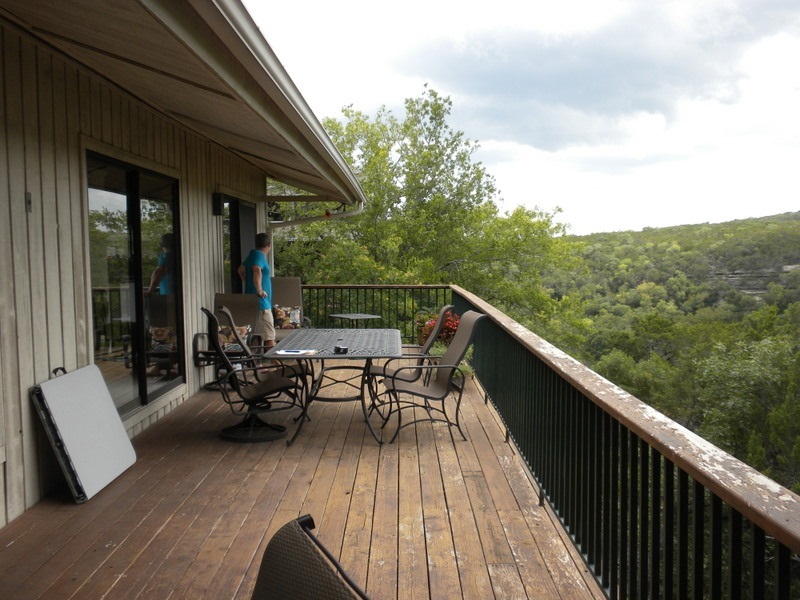 The beauty of a screened porch is that you get the pleasure of the outdoors without actually being outdoors. A screen porch offers an extension of outdoor as well as indoor living space. We are starting to see a trend in multi-structure outdoor living areas. These are outdoor living areas that contain the works. These can include open patios, outdoor fireplaces, fire pits, pergolas, outdoor kitchens and decks all in one. This offers homeowners the ultimate in luxury and convenience, not to mention adding to your home’s value. Our multi-structure designs are planned to compliment each structure as it flows together. Instead of getting an outdoor room, you are actually getting an outdoor paradise where each outdoor room or area caters to a specific function but also harmonizes with the other elements within the entire design. 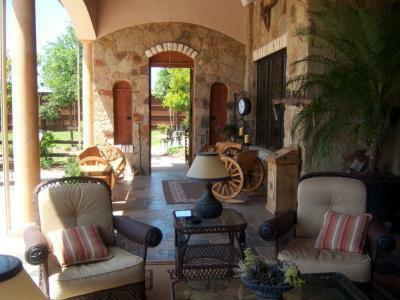 Imagine having an area right outside your back door where you can dine, cook, read a book, roast marshmallows, listen to the crackle of the fire on those cool Texas nights, entertain, or just enjoy the fresh air. Our combination outdoor structure in Riverplace has it all. See more awe-inspiring outdoor living rooms by visiting our outdoor spaces photo gallery located on our website. 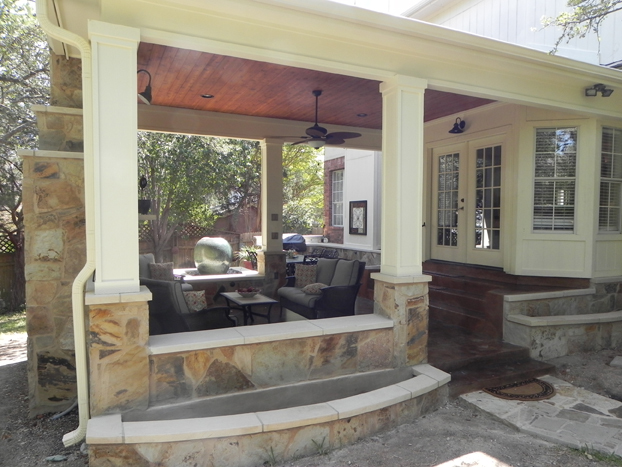 For more ideas on covered porches and covered patios you can visit our covered porch gallery, and our covered patio gallery, also located on our website. Why a covered patio is as good as gold! Over the last couple of years, we’ve seen a huge rise in the number of people looking for covered patios. But, today’s covered patios are nothing like the ones of old. Today’s patios are an outdoor room fully furnished with love seats, huge comfy chairs, outdoor rugs that look like indoors, fireplaces, outdoor televisions and all the accoutrements of an outdoor kitchen. The great thing is each covered patio is different. 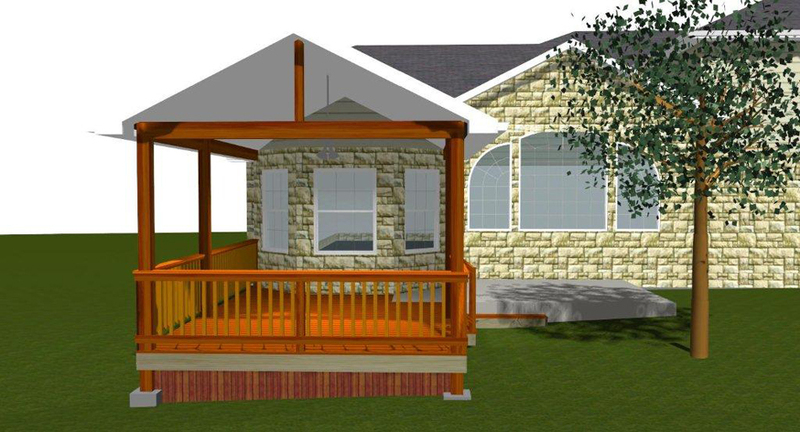 The fun part is deciding what custom elements to put into each covered patio. What is the most important thing you want to do in your outdoor room? What are another 5 or 10 things you want to do in that room? Are there times you want to entertain other people in the covered patio? How often? How many people? What activities? Question 1: What is the most important thing you want to do in your outdoor room? Often we start by thinking about where our room will be located in our yard or how we’re going to furnish it. While this is incredibly important, the answers to those questions should be derived from how you want to live in your room. Do you want to spend weekend afternoons out there watching football with good friends and having a place to warm snacks and keep drinks cold right at your fingertips? Or, do you want to spend chilly nights in your outdoor room reading books and snuggling near the fire? In short, what is the top thing you want to do in your room? Question 2: What are another 5 or 10 things you want to do in your new covered patio? Question 2 is very important because it will drive what features, how large, and other details about your room such as whether it will be completely open or have 1-3 closed walls. Question 3: What about entertaining other people? Do you host the family reunion every year? Do you host poker night or book club night or other important gatherings on a fairly regular basis? You might want to consider these when designing your room. When we say designing, you don’t need to do the architectural designing or any other up-front design. You simply tell us what you want and together we work to come up with a structural design that works for you. We review it together and make sure it’s exactly what you want before we start the job. Then you can do the fun designing – the interior design of your exterior room!! 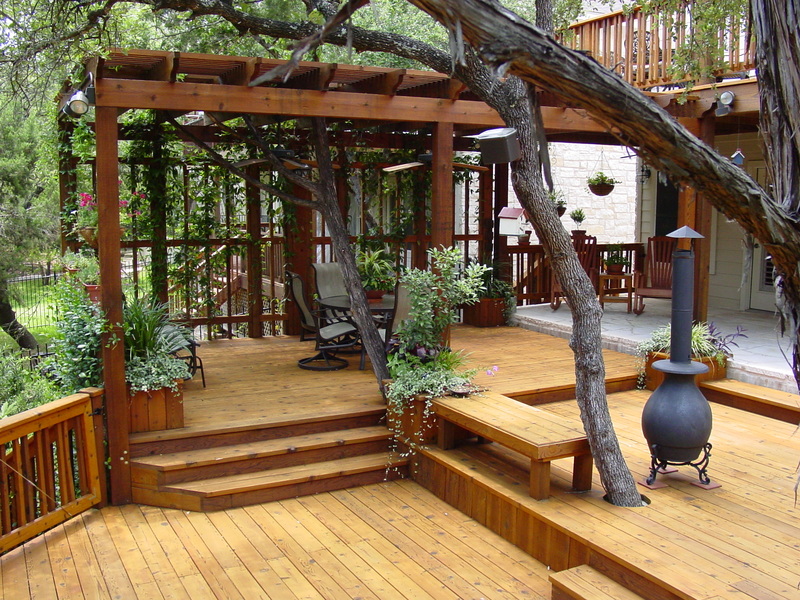 Give us a ring for a free consultation at (512) 259 – 8282 or send us an email at Austin@archadeck.net. Whether you’re ready to build now or in a few months, it’s never too early to start planning. Having an outdoor structure that functions as an outdoor living and gathering area opens up a whole new world of lifestyle possibilities. Being able to extend entertaining space from the interior of your home outdoors not only makes things run a little bit smoother when entertaining family and friends. It can also become a place that offers intimacy and refuge from a hard day. 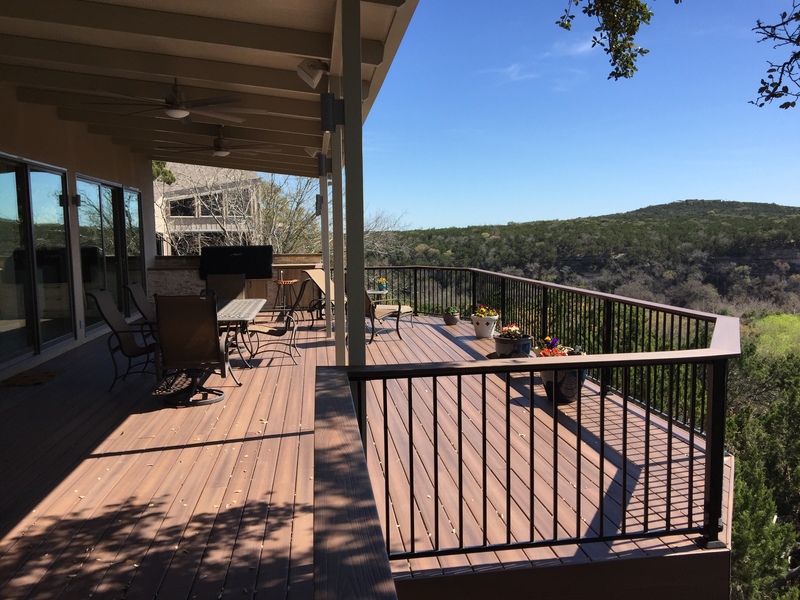 That is exactly the type of structure Archadeck of Austin built for these Austin, TX homeowners. This design incorporates a stunning covered patio which also contain an outdoor fireplace, a custom stone outdoor kitchen, stone benches and a stone surround that runs the entire perimeter of the structure that also serves as a hardscaped flower bed. The covered patio was designed in the spot where we removed an old sunroom. After removing the sunroom we extended the roof to accommodate the new covered patio. The patio floor is finished with stain and seal concrete to compliment the gorgeous custom stonework that was used throughout the entire structure. Some of the key areas where we used Leuders stone include the outdoor kitchen, the flower bed surround, the stone benches as well as the bench toppers and of course the mesmerizing multi-tiered outdoor fireplace. Within the interior of the patio cover we used a tongue and groove cedar ceiling to add some rustic flair to compliment the natural characteristics that are evident in the usage of the stone and concrete. We also stripped and stained the homeowners existing deck in order to match the hues found within the covered patio. The use of colors, textures and design lines throughout the patio make it truly breathtaking. The talented homeowners also finished the interior of the patio in expert style, with well-appointed patio furnishings and well blended accessories that tie the whole project together perfectly. 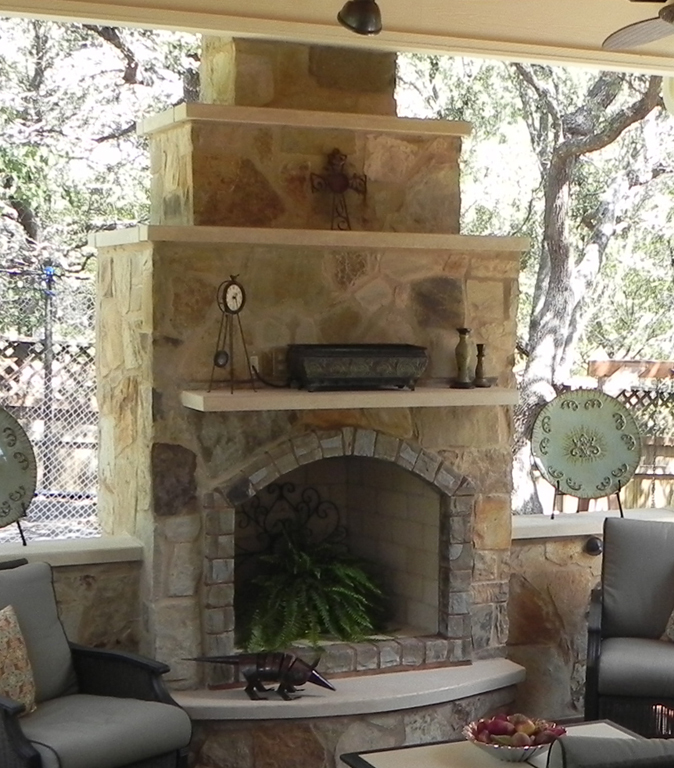 The unique design of this Austin, TX outdoor fireplace features custom multi-tiered ledges. The focal point within the porch cover is undoubtedly the elegant multi tiered custom stone fireplace. The homeowners took a unique approach to the popular practice of utilizing a TV above an outdoor fireplace. Many homeowners opt to construct a recessed perimeter to house their TV, such as a flat screen, for permanent placement. These Austin, TX homeowners did not wish to keep their TV above the outdoor fireplace permanently, so we designed the fireplace using multi-tiered custom stone ledges with a customized pull out shelf on the fireplace’s mantle that is outfitted with a cable and electrical outlets. This shelf makes it easy to place the TV on the outdoor fireplace whenever they wish, and when the TV is not in use, the shelf can be pushed in and hidden and no one is none the wiser. This feature is an example of this structural convenience that is built into every inch of this outdoor structure. Archadeck of Austin also made certain to add plenty of outlets into the columns used on the patio cover, to add more convenience as well. This image shows in detail all the beautiful stonework that went into building this breathtaking outdoor fireplace. The expert stone work on this structure was achieved using select Antique Leuder’s stone, which is an upgrade from limestone. The use of this stone can be seen in the bench toppers, the outdoor kitchen, the stone benches under the roof cover and many other areas throughout this outdoor oasis. 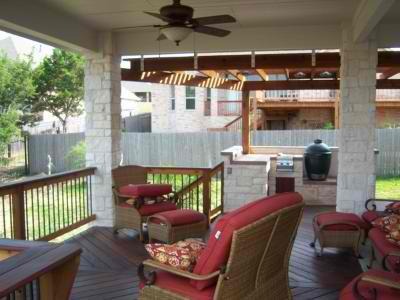 To create an essence of ambiance, Archadeck of Austin made sure to include outdoor lighting throughout the patio cover. The creative placement of a large amount of low voltage lighting around the entire perimeter adds to the “feel” of relaxation and refuge. Low voltage lighting was placed strategically within the stone benches, surrounding the open area we built to showcase a water feature, and we added recessed LED lights in the existing decks as well. 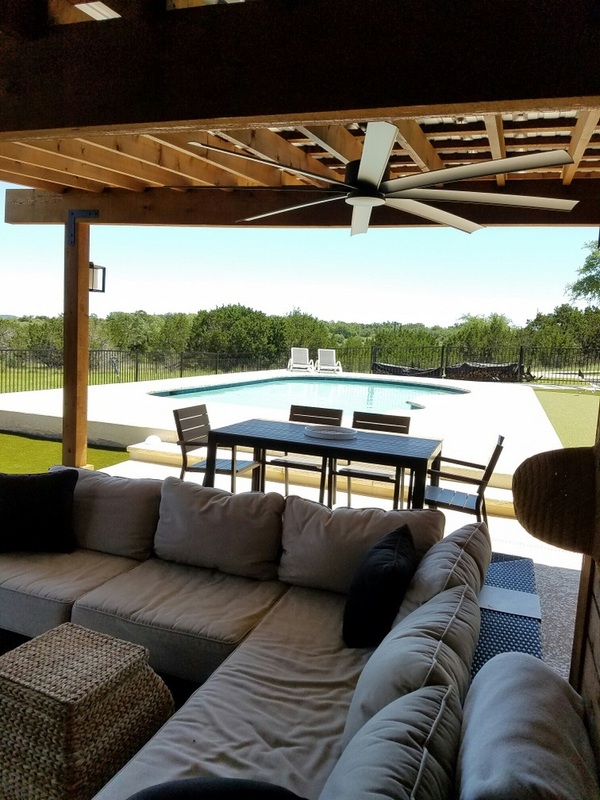 These Austin, TX homeowners are now sittin’ pretty in this breathtaking covered patio, that is full of amenities to refresh their senses and their soul. A multi-functional outdoor structure design such as this could not be accomplished without having a project manager to contact at any time which always plays a positive role in seeing a structure to fruition. Our expert project managers are a big bonus for going with us. 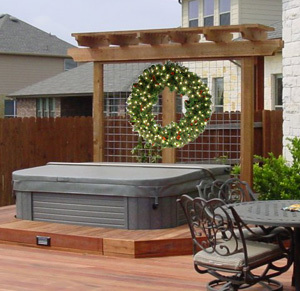 To learn more about our stunning outdoor living designs, contact Archadeck of Austin today.